Assassin’s Creed fans were elated when Ubisoft revealed that a new entry in the franchise is coming our way, and will be released in late October this year. Of course, this was hardly a secret due to numerous leaks, but it’s still great to know that Assassin’s Creed will have a chance to seize the spotlight again this year after the previous two entries failed to set the world alight. 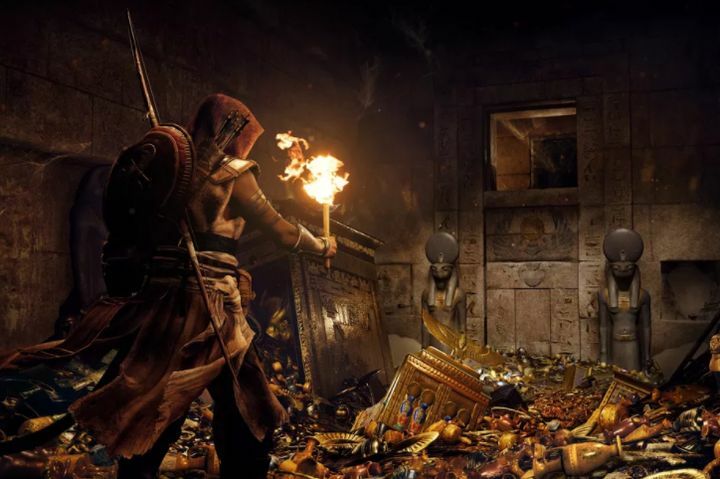 The new game will be titled Assassin’s Creed Origins and is set in ancient Egypt, and aside from being able to climb the Pyramids, it will also be possible to use a bow while riding a camel and perform other cool stunts as seen in the game’s reveal trailer. 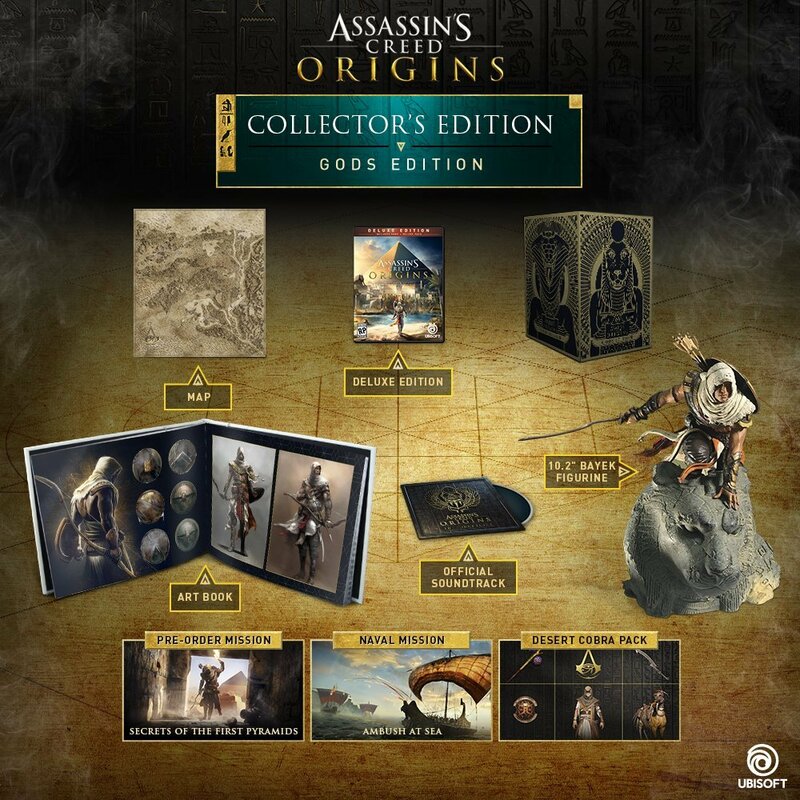 And as was the case with earlier Assassin’s Creed games, Ubisoft will be making a Collector’s Edition of the game available aside from the standard edition of the game. This edition, also known as “Gods Edition” is one of three collector’s editions of Assassin’s Creed Origins, which will be available for sale this fall. The Gods Edition includes a series of extras that will surely be welcome by fans of the series, amongst these being a map which shows some of the areas will be able to visit in the game. Apart from the map, there’s also a 10.2” figurine of Bayek included in the box. This Bayek guy will be the protagonist in Assassin’s Creed Origins, and hopefully will be a match for earlier Assassin’s Creed characters such as Ezio Auditore or Edward Kenway of Assassin’s Creed IV: Black Flag. This edition also features a case with the game’s Blu-ray (the same as the Deluxe Edition of the game), and an art book featuring concept art and illustrations related to this latest Assassin’s Creed game. There’s also a CD with the game’s official soundtrack, which will likely be a worthy listen taking into account that the music in the Assassin’s Creed games has surely been great to date. Also, pre-ordering this or any other edition of the game will get you the “Secrets of the First Pyramids” mission, which is something to take into account if you would like to play this bonus mission on the game’s release date. So this Assassin’s Creed Origins Collector’s Edition sure packs an impressive number of extras, although it will only be available for PS4 and Xbox One, and not PC. Also, it will retail for $119.99 in the US and will be available on October 27, 2017, which is Ubisoft’s already-announced release date for this latest entry in the Assassin’s Creed series.